For nursing major Andrea Daube '17 the seeds of patient care were planted back when she volunteered in hospice during her high school years. "For a long time, I've known I wanted to be involved in healthcare in one way or another," Daube said. "I loved working in hospice care; the patient contact became something really important to me." And by the time she made her way to The College of St. Scholastica as a freshman transfer student, she was ready to make a difference. Upon her arrival on campus in Duluth, Daube didn't struggle to develop relationships; she joined the Social Justice club, and even started a club of her own — Sisterhood at CSS, a discussion-based feminist club. "Sisterhood at CSS is a feminist organization on campus where we've created a space for students with similar values and goals," said Daube, who is also a trained Gender Equity and Anti-Violence Allies (GEVA) advocate on campus. "It's evolved to a more action-oriented group where we attend protests, attend awareness events, and volunteer with a local sexual violence shelter." Daube said she's loved the nursing program thus far, and in January 2017 had a wonderful opportunity to spend extra time with two of her favorite instructors, assistant professors Paula Byrne, MS, PHN, RN, and Gina Diaz, DNP, RN, ANP, GNP, on a study abroad trip to the Philippines. "I admire my professors so much, and enjoyed them in classes before the trip, so it was incredible to get to know them some more in terms of mentorship, and on a personal level," Daube said. "We spent three weeks serving at Mary Johnston Hospital in Manila, partnering with Filipino students and learning from each other. Seeing the poverty and great need definitely gave me a more global perspective." 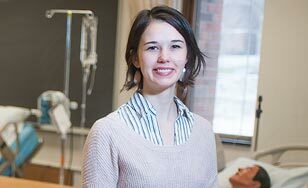 As a women and gender studies minor, it's no surprise Daube spent summer 2016 completing internships at not one, but two local women's health centers. "I was able to work with a mentoring program that raises awareness around different issues of reproductive healthcare," Daube said. "We met weekly with a diverse, low-income group of Duluth high schoolers." Daube has one eye on graduation, and another on the future — she plans to dig deeper into women's studies, and earn her Doctor of Nursing Practice en route to serving the greater good on a global scale. "After my doctorate, I'll be pursuing work in women's health," Daube said. "No matter where I end up working, I intend to make advocacy for women a big part of my future." Daube said the biggest reason prospective students would love St. Scholastica is that constructive feedback can shape classroom dynamics and curriculum. "What drew me to this program and kept me here was was the school's willingness to consider students, and make sure the program was meeting our needs," she said. "The faculty and staff listen to us." CSS offers more transfer scholarships than any other private college in Minnesota, and more than most public colleges and universities. Learn how we can help you complete your degree.